Wednesday, April 7, 2004 . 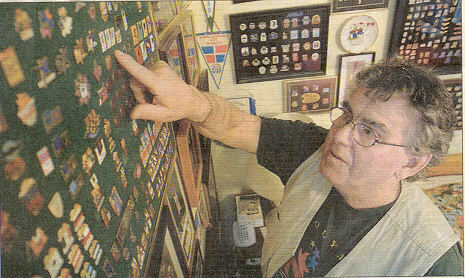 Ivan LeBlanc points to one of thousands of Olympic pins he has on display in his home. For many Canadians, including Winnipeg’s Ivan LeBlanc, the 2010 Winter Olympics in British Columbia will be their first-ever opportunity to visit the prestigious sporting event. But for LeBlanc, the 2010 Olympics won’t just be a chance to take in some of the world’s best athletes demonstrating their talents, it will also be the high point of his 20-year love affair with Olympic pins. LeBlanc is the vice-president of the Winnipeg Pin Collectors Club, whose approximately 60 members meet monthly at the Vince Leah Recreation Centre on Salter Street. Each pin collector has their individual interests, and for LeBlanc, Olympic pins are the ones most likely to catch his eye. “I started collecting pins about 25 years ago, and then after a while I became interested in Olympic pins. That was about 20 years ago. I now have about 15,000 or 16,000 Olympic pins,” he says with a chuckle, sounding almost uncomfortable at numbering the sheer volume of pins he owns. In fact, he says the reaction he gets from people who visit his home and see the wall-to-wall display of pins is usually one of utter disbelief. “They just say, ‘Oh my God. Are you crazy?”, he laughs. Not to mention the reaction he gets from his interested but supportive wife Connie. “She just shakes her head,” he says, still chuckling. “But she has never once discouraged me from collecting.” LeBlanc defends his collecting habits with some astute logic. “I view it as collecting a piece of history,” he says of the collection which dates back to the 1936 Berlin Olympics, hosted by Adolph Hitler’s Germany. Currently, LeBlanc has pins from every Olympic event since 1936, a fascinating display of the evolution of pins and Olympic design in the 20th century. The retired Winnipeg Hydro lineman says Olympic pins come in a variety of types, including the official International Olympic Committee-endorsed pins, which range from individual sport pins to individual country pins. As well, there are sponsor pins, such as McDonalds and Coca-Cola, and LeBlanc’s personal favourite, media pins, such as those created for the CBC, NBC, and BBS television networks. There are Olympic pin rules, says LeBlanc. For example, countries that are pitching their cities as a potential host of an Olympic games can’t use the official five-ring Olympic logo on their promotional pins until they reach the short list of final three or four candidates. The Winnipeg Pin Collectors Club meets on the second Tuesday of each month at the Royal Canadian Legion – Norwood Branch, 134 Marion Street, from 6:30 to 8:30 p.m.